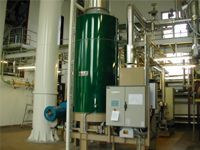 Ever since its establishment in Bulgaria in 2008, Filter OOD has been offering high quality solutions in various activities related to manufacturing processes which require electrical and steam heat, hot and cold water, thermal oil or hot air while reduce costs and achieve maximum operational efficiency. Ensures high efficiency and long life of the equipment, which ensures the profitability of the investment of the customer. Mr. Kostadinov, Filter began its development in 1992. Tell us how the company has grown over the years. Filter Group was founded in 1992 in Estonia and since that time has grown to a company with subsidiaries in Latvia, Lithuania, Russia, Belarus and Bulgaria. Filter establishes companies in Latvia and Lithuania in 1994, in Belarus in 2004 and in Bulgaria in 2008. In 2009, FILTER acquired two Russian companies: ZAO HyXo in Moscow and ZAO Vapor in Saint Petersburg. At present, Filter has in total 14 offices in 6 countries. There are over 230 employees working within Filter Group. What kind of services Filter offers? All combined heat and power plants, built by Filter group are engineering solutions, developed in relation to the individual requirements of each client. Give us an example of a recently built plant. The company works on construction of new installations and maintenance of existing ones with many of the greenhouses in Bulgaria, some district heating and industrial companies. Some of our clients are: "Zagorka" AD "Veolia Energy Varna" EAD, "District Heating Vratsa" EAD, "District Heating Sofia" AD - TP "Zemlyane", "NPP Kozloduy", Greenhouse complex Kresna and others. Filter Group’s companies have a long and successful cooperation with world leading manufacturers of power equipment. Which companies have authorized you to be their unique representative and service partner in Bulgaria? and many European producers of applicable components for CHP plants and industrial equipment. From which industry sectors are your current customers and which sectors would you like to expand your company parameters and contacts to? Our clients are industrial and energy companies, hospitals, municipalities, commercial and residential parks, as well as sports facilities. Some of our clients are: Veolia Energy Varna EAD, Sofiyska voda AD, District Heating Sofia EAD, District Heating Razgrad EAD, District Heating Vratsa EAD, Zagorka AD, DS Smith Bulgaria S.A., Alt Co’s Greenhouse complex, Knauf BG and many others.